9:15 AM; arrival at Bussum. It's pretty quiet as we arrive at the fair building. Most standholders are still busy setting up their booths. The fair is smaller then last year but the different rooms are big enough for all standholders. The fair is mainly one hallway and 4 rooms providing space for 11 standholders. Around 10:00 am the first visitors arrive. In the first room the MSX Resource Center is located selling lots of stuff and displaying all prizes than can be won in the MSX Quiz 2002. Also present in this room is Sunrise Foundation, promoting and selling their hardware products like the Moonsound. In the hallway next to this room we find Grauw from TNI presenting a new idea (by BiFi and others): the MSX assembly page. This page is supposed to be stuffed with assembly help, info and ofcourse sources. It's not finished nor online yet, but when it's there we'll let you know! In the room across TNI's booth we find MSX info and R-soft. R-soft is presenting their MSX network device called first contact. Had a little fun chatting on two MSX's R-Soft is also working on a little racing game which looked very promising although I did not see a lot of it. Next in the hallway is openMSX, a linux only MSX emulator which is simply amazing. openMSX was presenting version 0.2.0 alpha of the emulator and also sold copies of it on a bootable linux cd which includes the MCCM millenium CD also for the real small price of 2 euro's! Watch out for the upcoming MSX Resource Center MSX emulator comparison version 2.0 because it will enter this comparison with a bang! In the next room Deltasoft, MSX club de Amsterdammer and MSX NBNO are present. Deltasoft is selling their products amongst which is the translated version of XAK I. De amsterdammert is selling DD discs and MSX NBNO is present selling HNOSTAR and NV magazines. Across this room is Team Bomba showing a more recent version of BombaMan translated in a.o. Japanese and Spanish. At the end of the hallway I find a miniature railroad controlled by an MSX. Around 2:15 pm The MSX Resource Center stopped accepting new quiz forms and started counting points. A total of 43 points could be gained by answering all 40 questions with the rights answers. The quiz was more difficult this year which was noticable by the amount of quiz's we received back Although it was difficult Patriek Lesparre managed to get almost all points. Last year he had also won the quiz, so he kept his title! All day long people discussed about the answers and in the end many were suprised by the outcome of the quiz. Therefore all right answers will be online very soon! Patriek was able to pick a price first, because he had won. He choose the complete Konami Usas cartridge. After that 6 more pricewinners got their prices (Konami's Monkey Acadamy, Konami's Vampire Killer Japanese, Konami's Goonies, MSX Fan 18 - 25, MSX Fan 4 sealed, Nintendo Game on a keychain and a KOEI game with map). After the quiz, R-Soft presented their first contact network on MSX. All day long visitors were able to check the system out on 2 MSX machines running a chat application. 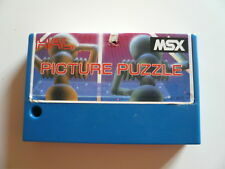 R-Soft explained how the system works and earlier (before the presentation) even talked about their racing game becoming playable multiplayer using first contact And just when everyone thought the fair was over, the MSX music Quiz started. The intention of this quiz was to play or 'humm' a piece of ingame music from an MSX game after which the audience had to guess the right song. This turned out to be a lot of fun as most people could not play the keyboard and therefore had to humm a song. I can tell that it's fantastic that when you humm "Taaaaaaaa dam! ", the whole room knows you're humming Metal Gear 1 After this the fair ended and the marathon started. The marathon went on until the next morning. In total around 50 visitors and 35 standholders were present. Which is quite alot I think, so let's all agree to see eachother next year and bring more MSX friends with you!! !